Under normal conditions, it will take thousands of mileage before you have to change your brake rotors. The rotors are made for durability but at some point, they do wear out, and you will need to change them. The rotors are made from a metal coating and due to constant friction wears out. Rotor wrapping occurs when the rotor is not perfectly circular. This results in uneven application of the brake pads which may hinder the car’s ability to stop. A closer observation of the car wheels will reveal a circular disc called the rotor. Whenever you press the brakes, the hydraulic fluid is activated, and the brake pads hold onto the rotor to stop the car. There is often a lot of heat that is produced due to the friction between the brake pads and the rotor. This heat is dissipated by the rotor. The material used to make the rotor is very sturdy, and you will need to have traveled hundreds of miles before you need a new set of rotors. The primary reason for brake rotor replacement wearing out due to frequent friction with the brake pads. A worn out rotor makes it hard to stop the car and can cause accidents if not replaced immediately. The first thing you will notice when the rotor becomes worn out is that the disc becomes uneven. Replacement options vary. You can opt for blanks replacement. This is the most common type of rotor – it features a smooth and flat disc. Slotted rotors feature angled slots that have been engraved in the disc surface. There are preferred by those who seek extra car performance. Both the drilled an slotted discs dissipate excess heat from the wheels through holes in the disc. The disadvantage of using slotted slots is that they chew up the brake pads faster than the blank rotors. The drilled rotors are less durable due to the materials used. They also do not last long because the material has been removed from the disc. What are the signs of a failing brake rotor? The brake pads and the disc work hand in hand. The rotor is directly attached to the wheel and is span by the car’s axle. The brake pads hold onto the disc the moment you press the brake pedal. Brake pads wear out at a faster rate than the disc. Noisy brakes are the first sign of brake rotor replacement. If the disc is uneven, you will hear squeaking noises coming from the wheels. The warped rotors produce a squeak while the extremely dilapidated rotors will produce a scraping sound. You will need to dismantle the wheel to distinguish whether it is the disc pads or the rotor that is worn out as both produce a squeaking sound. It is dangerous to drive your car with worn out disc brakes. The squeaking sound will often be accompanied with excessive vibrations from the worn out brake rotor. If the wearing out is excessive, you will feel it in the brake pedal. The warped brake rotors may also cause the brake pedal to pulsate whenever it is pressed. The reason for this is that the pedal is no longer coming into contact with the rotor. Driving the car with vibrations can be dangerous especially at high speeds. The worn out pedals make it hard to stop the car. You will need to keep applying the brakes for the car to come to a stop. The extended stopping distance is extremely dangerous especially when the driver is forced to make an emergency stop. Worn out brake rotors often display grooves on their sides. The rotors are created to last for tens of thousands of miles. Repeated contact with the brake pads will wear the rotors over time. Brake rotors replacement is pretty straightforward once you have the necessary tools. You will need to wear a pair of gloves before embarking on removing the old rotors. Use a jack to raise the car to a level where you can remove the tire. First, loosen the nuts with a wrench before raising the car; do not completely remove the nuts but let them loose. Place a rock on the other wheels to prevent the car from rolling. Ensure that the hand brake is on. You can also use jack stands to place the car once lifted off the ground. Just like changing a flat tire, ensure that the jack stand is put on the thickest part of the undercarriage. Remove tire, and you will notice the rotor and brake pads mounted behind the wheel. Be careful, not lose any of your nuts; you can store them inside the car or on the wheel hub cap of the removed tire. Use a ratchet to remove the brake calipers. They are usually put in place by one or two bolts. 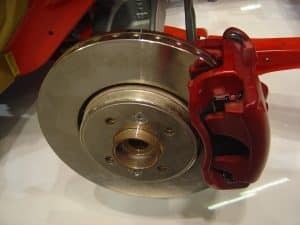 Once all the nuts have been removed, you can safely remove the brake rotor. 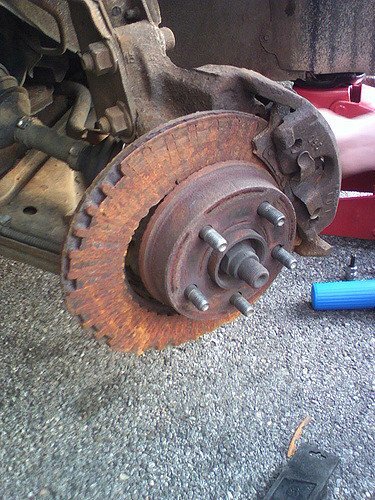 If you have been driving your car for miles, the brake rotor can be stuck due to corrosion. You may need to hit it a little with a hammer to loosen it. Clean the surface where the old rotor was so that the new one can be mounted on a clean surface. Due to corrosion, you may be forced to scrap the rust with a soft brush. Inspect and replace any of the bearings and grease seals. Ensure that the new brake rotor is spotlessly clean. You can use brake cleaner solvent to clean any particles. Mount the new brake rotor on the wheel studs. Replace any nuts that you had removed. You can now safely put the tire back and lower the vehicle. The brake rotor has a lifespan of thousands of miles, but it does wear out with time. You will know that your rotor needs replacement when you notice vibrations or a squeaky noise from one of the wheels. A worn out brake rotor should be replaced immediately to prevent accidents.